Anooshiravan Karimi is the managing partner at Karimi & Associates Law Firm. He is a graduate of Bachelor of Laws, 2008. He also holds a master degree in International Law and certificates of participating in Training on clinical legal education and legal aid from International Bar Association and IBA & nationwide union of Iranian bar association. As a member of Iranian Central Bar Association, Anooshiravan Karimi is now a Tehran-based lawyer and legal advisor. The Firm initially started its activity with Dr. Ahmad Hooman (Former Chairperson of Bar Association), Dr. Ebrahim Taghvaei, Ebrahim Emami Khooyi and Majid Amirebrahimi in 1963.The current law firm known under the registered name of Karimi & Associats law firm in Iran was constituted with the aim of transferring the knowledge and experience of this first generation to a new younger generation of lawyers. 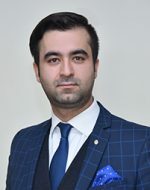 Since the formation of Karimi & Associates group as a registered firm, this ongoing effort has been made to pursue this goal with the presence of Ezzatollah Karimi and a team of expert lawyers specialized in different practice areas, benefiting from experience of the older generation and fresh ideas of the younger generation to provide a unique combination of skills and expertise to help clients resolve their most complex legal issues. Karimi & Associates Law Firm owes its reputation to a renowned legal team composed of expert lawyers and legal assistants belonging to young and older generation that enable us to combine experience, innovative thinking, Integrity and diversity in our legal services.